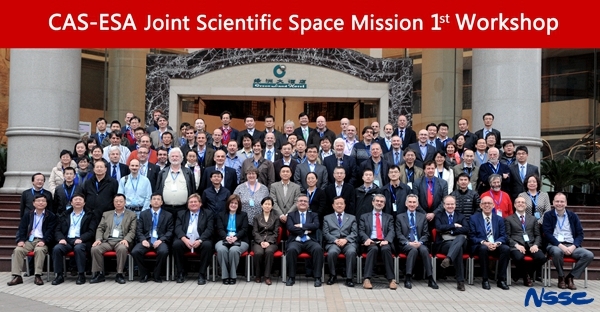 The First CAS-ESA Joint Scientific Space Mission Workshop, organized by the National Space Science Center (NSSC), Chinese Academy of Sciences, was held on February 24, 2014 in Chengdu. 98 scientists coming from 11 countries including, U.K., U.S., France Germany, Italy, Sweden, Switzerland, Netherlands, Portugal, Belgium as well as China participated in the workshop. Professor WU Ji, Director General of NSSC, CAS, delivered an opening speech and stressed that the purpose of the workshop is to "generate some good ideas after discussion". Alvaro Geminez, Director of Science and Robotic Exploration, ESA, remarked that “with the Chinese Academy of Sciences, we have the great opportunity to open a new way of cooperation". Fabio Favata, Head of the Science Coordination Office, ESA, briefly introduced the joint mission, giving a panoramic picture to the participants. Frederic Safa, Head of Science Operations Division, ESA, made an introduction of the Technical Constraints. There are altogether 4 invited talks, 27 oral presentations with 12 from Europe and 15 from China, 18 posters with 14 from Europe and 4 from China. The participants engaged in extensive and in-depth discussions in the field of space astronomy, solar physics, space physics, fundamental physics etc. On the 9th ESA-China Space Science Bilateral Meeting held in May 2013, ESA and CAS entered the agreement to issue a joint call for the joint mission. The workshop is the first step towards the joint call to be released by the end of 2014. The second workshop will be held 24-26 Sept, 2014 in Denmark.